Good Samaritan Hospital in Dayton, Ohio undertook a renovation to convert 4 older operating rooms originally built in the 1980s into 3 state-of-the-art cardiovascular operating rooms. The project was completed in the spring of 2009. To meet current needs, the hospital needed to have operating rooms that were more spacious than the old ones, which led to the renovation. 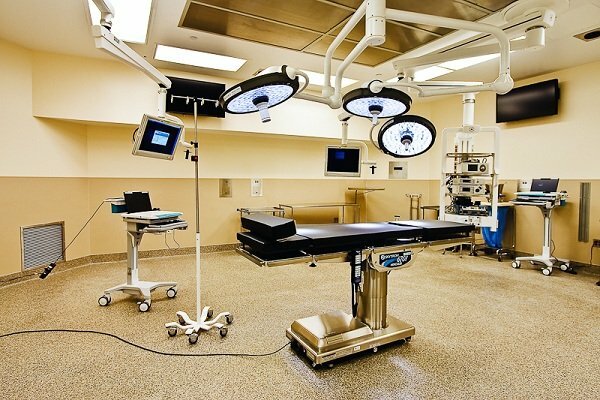 The new operating rooms feature several elements that put them on the leading edge of surgical facilities. These were the first operating rooms in the country to use new LED surgical lights by Steris Corp. These lights are brighter and whiter than previous lights, and, at the same time, they last longer and use 30% less energy than conventional surgical lights. However, these lights almost didn’t get used. The lights just obtained final FDA approval only a week before the team needed to make their decision about fixture selection. The operating rooms also feature computer control systems that allow a number of controls for the room including lighting level, display on the flat-panel monitors and even the music that is played in the operating room. Everlast Epoxy Floors were used to complement the look of the rooms as well as to provide a high performance surface for the demanding hospital environment. Dara Sharp, Principal Architect at Sharp Conway Architects, LLC, and Kathy Casey, Nurse Manager of ORs at Good Samaritan Hospital spoke with us about this project. Q: Why did you choose Everlast Epoxy floor? DS: We selected it because epoxy flooring is stain resistant. The epoxy resists iodine staining and doesn’t absorb the cleaning chemicals like vinyl flooring can. Also, sometimes the dark vinyl that is used doesn’t look clean. KC: Epoxy flooring like this hasn’t been used in this area before, so we didn’t know how well it would work. Before we used it in the operating rooms, we had the company pour an 8′ x 8′ sample in the basement area of our Environmental Services department. Once it had set, they used many different chemicals and cleaning agents on it to see if it would stand up to them. They also poured betadine, and a few other agents that would typically stain an operating room floor, on the area and none of the agents stained it. At that point we were sold on the Epoxy flooring. Q: Are there other benefits to using an epoxy floor? DS: The epoxy floor is monolithic. This meant we were able to have an integrated cove base with the same material. An epoxy floor also doesn’t need a separate sealer, like a vinyl floor would. Q: Has Everlast Floor met your expectations so far? KC: We like that the floor has a little bit of texture. That helps keep equipment from rolling around when we don’t want it to. Q: Would you recommend Everlast Epoxy to other architects? DS: Yes, I would. We have heard from our clients that the users really like it, too. KC: The floor is wonderful. It’s better than the other floors we have in other parts of the hospital.